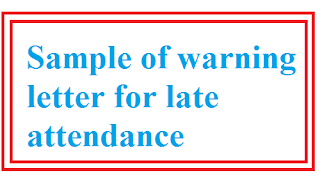 On the other hand, if you are under an organization and want to eagerly see how a warning letter for late attendance will be, you may also refer this letter of late attendance provided here under. It has been noticed that you have been late to your job without receiving prior permission from your supervisor on ______ and ________. And you are taking this after availing the allowable late as per the company norms. 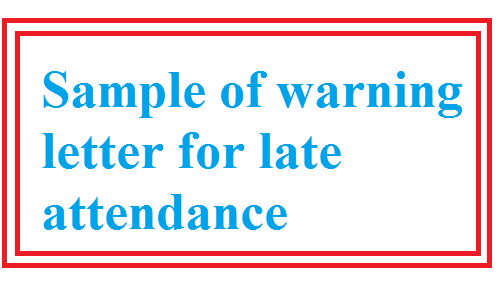 If your lateness continue without prior permission, you are behaving irresponsibly and opening yourself to disciplinary action. So you are hereby warned not to continue this inappropriate behavior in the future. If you do, you shall invoke the appropriate disciplinary action. The management hereby would like to request you to submit a written explanation for lateness within two working days of receiving this letter. Kindly treat this as an urgent matter. Note: Please take the above letter for a sample only. You may modify the contents part according to your requirements.